Absalom and his rebellion are dead. David is heading back to Jerusalem. On the way, he gave rewards to Barzillai who had provided an enormous amount of food and other necessities when David fled Jerusalem with a huge number of subjects with him. David blest Barzillai by blessing Chimham, who was likely Barzillai’s son. Previously, I had suggested that David’s crossing Jordan and then coming back across Jordan was a picture of death and resurrection. Furthermore, we saw a very certain fulfillment of this type at the first appearing of Christ, and I wondered if there might also be some applicability to the second appearing of Christ. The following, well-known parable in the gospel of Matthew is one in which Christ is unequivocally speaking of His second appearing. He comes as the bridegroom. There are some aspects about this parable which have puzzled me for years. I have read and heard many interpretations of it and I am not convinced anyone has “nailed it.” Nor am I saying that this is the one and only way to look at it either. I am setting it forth as another possible interpretation. The ten virgins symbolize the northern house of Israel, the ten-tribed house. But the question immediately arises: then why the split between the five wise and five foolish? Why not six and four? Why not seven and three? Looking back at our opening verse we notice that all of Judah came to welcome the king, but only “half the people of Israel”, i.e., only five of the ten tribes. So is it possible that this is a type signifying Christ returning at His second advent and finding only half of Christian Israel (five virgins) ready to meet Him? One becomes a “virgin” spiritually by faith in Jesus Christ and water baptism. (See our ten-CD or tape album on The Laver: Washings, Cleansings, Baptisms, Circumcision. SKM code A-106: $33 ppd.) The parable calls all ten of them virgins, so we conclude that all ten were “saved” Christians. But I would suggest that the five foolish virgins were those who are pausing on the path to complete salvation. They have stopped on the path because they have been mistaught to think that where they are at spiritually is all there is. In other words, one should “get saved” and that’s all there is to it, except to try to “save” others from the flames of hell as well. Most go on to the laver; i.e., they submit to water baptism. But these brethren stop there because they think that where they are at is all there is. They never enter into the Holy Place. The way in to the Holy Place is narrower than the way into the Outer Court. In the Holy Place is where five of the virgins get the oil of the Holy Spirit. The Holy Place is where the Christian learns to hear God’s voice. Now a moment of levity: In our lengthy study of the tabernacle and all its accoutrements, we learned that the oil in the lamps in the Holy Place was olive oil. Do you suppose that it was extra virgin olive oil? 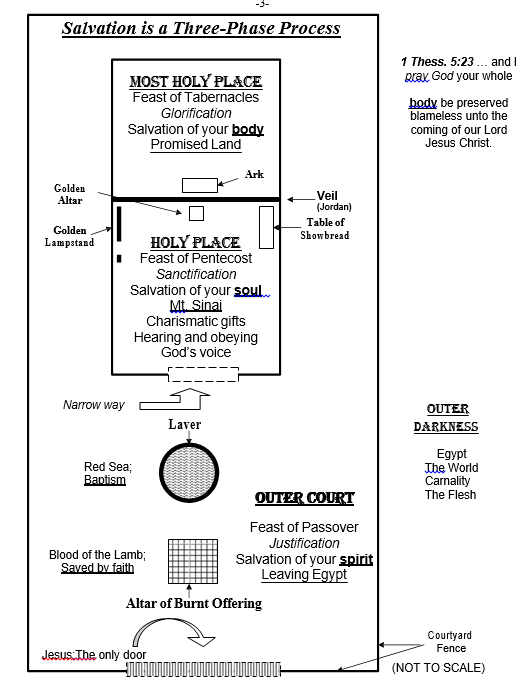 The Outer Court symbolizes the salvation of our spirit; the Holy Place represents the salvation of our soul, which is a process. And of course, no one goes into the Holy of Holies permanently until we cross Jordan (death) and are resurrected, and that event will be the salvation of our body, because we inherit an immortal and incorruptible body. So in summary, the five foolish virgins symbolize about half of all Christian Israel. They come to know Christ, but only on a very superficial level. They think stage one is all there is. Some do not even progress to the laver (water baptism). Whereas those who have oil in their lamps are those who are already in the Holy Place when the bridegroom comes. Therefore, when He arrives, they are ready to go into the Holy of Holies (to be translated into immortal bodies). I offer that interpretation to you as just something to ponder. Back to the historical record… We saw that half of Israel was there to meet David. A short time later, the five foolish virgins show up, because now it says “all”. And they immediately start bickering. 2 Samuel 19:41 And, behold, all the men of Israel came to the king, and said unto the king, Why have our brethren the men of Judah stolen thee away, and have brought the king, and his household, and all David’s men with him, over Jordan? 42	And all the men of Judah answered the men of Israel, Because the king is near of kin to us: wherefore then be ye angry for this matter? have we eaten at all of the king’s cost? or hath he given us any gift? This could be typical of several things, but at least one scene in the New Testament comes immediately to mind. Remember, the type is that there is an argument between Israel and Judah, what would later be the ten tribes vs. the two, but now concerning who has the greater privilege to be closest to King David as he comes back into his kingdom. In Matthew, chapter 20, we find some rancorous disputing and indignation about who gets to be closer to Jesus when He comes into His kingdom. Her two sons, of course, were the apostles James and John, nicknamed, the Sons of Thunder. You see the parallel? What was she asking? ...That James and John be granted the privilege of being closest to the King in his kingdom. There we have the ten and two division again, played out on a personal level among the 12 apostles. But this bickering has also played out for hundreds of years on the corporate level among the various divisions of Christianity. From the time of the Acts of the Apostles, where they bragged “I am of Paul,” or “I follow Apollos” to the split between the Eastern and Western churches about a millennium later, to the split between the Roman church and the Protestants about a halfmillennium after that. It goes on even (especially) today as we have 1,200+ denominations. The Baptists brag that their church goes back to 33 A.D. The Methodists counter-claim that does not matter, seeing that their doctrine is false, which causes the Presbyterians to shout “likewise” to the Methodists. Of course, the papists still claiming that no one will be in heaven except Roman Catholics because theirs is the “only true church,” and on and on ad infinitum. Every denomination has erected doctrinal walls around their flock and threatens them with being excluded from being with Jesus in the kingdom unless they toe the line to their particular traditions and interpretations of Scripture. One of the brothers in our Atlanta fellowship told me that one day he got to talking with a stranger a little bit about religion and the person asked him what denomination he was. Our brother—being a tactful person—told me that he simply replied that he was non-denominational, but that he was very strongly tempted to say he was “denomination-free.” I have a hunch that when we all see Jesus in the kingdom, that some hard-nosed denominationalists are going to be very surprised to see who is there. Because after all, having 100 percent perfect doctrine is not a requirement for being in the kingdom, but love is: loving God and loving your neighbor as yourself. In wrapping up the past several issues, we have seen Joab continue in his own brand of a Saul-like character. With his brother, Abishai, he was not only ready, but eager to wield the sword [hear his snarling voice] to enforce the law, the letter of the law. Nor can any person with a Jonah attitude. You know what a Jonah attitude is, don’t you? It was when Jonah was first commanded to go and preach repentance to Israel’s enemies, the Assyrians in Nineveh, and he was angry about it and refused to go. Why? Because the Assyrians were the bad guys and Jonah did not want to see the bad guys converted. But once God caused Jonah to become ambergris (look it up, yuk!) Jonah himself was converted to a universalist. There is a lot of Jonah’s old attitude in the Christian Israel circles today, but I am pleased to say that our work is having a serious impact. And by “our” I mean all of us who teach the really good news of universal reconciliation. Our universalism is not the any-religion-will-get-you-there universalism. It is not the liberal, socialist universalism of the Unitarian Universalists. We teach true Christian, Biblical universalism. My hope and prayer is that someday everyone will see it, and I know that prayer is going to be answered. God speed the day!